C# is the most important note to add to make your improvisation sound "majory"
Remember we're adding notes to a standard A MINOR Pentatonic scale. Example 1 - Practice going down A minor pentatonic with the added C# note until it becomes second nature.This is fairly central to this style. Example 2 - make sure you are bending up a whole tone from B to C# - if you are really used to playing minor pentatonic all the time this may feel a bit strange but persevere to get that strong major note every time you want it. There will be more on semitone bends later on in this tutorial. 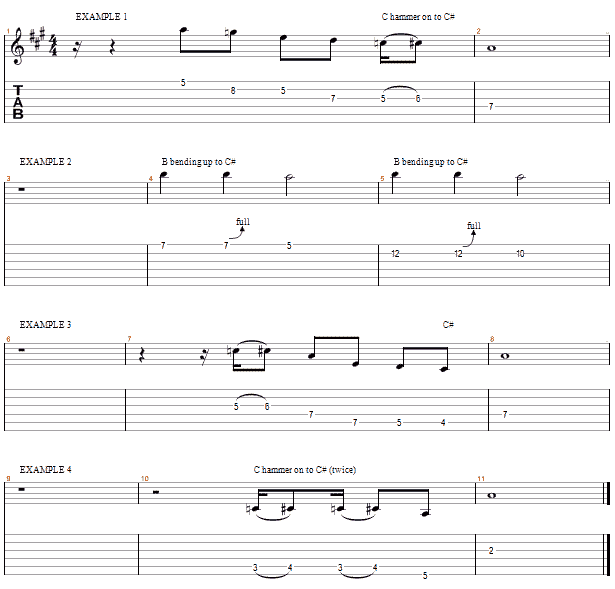 Example 3 is one of my favourite licks in this style - I have loads of variants all ending with a duck down to the low C# and then ending on the higher A. Example 4 is the phrase played at the end of the video.